Apples, pears, peaches, mangoes, and watermelon contain the fruit sugar fructose, another belly-bloat culprit. Canned fruit can be worse, since most contain sugar-free sweeteners called polyols, which are hard to digest. Again, this doesn’t mean you should cut fruit from your diet—just take note on special occasions. While popping a piece for fresh breath on date night isn’t going to make your tummy expand, chomping down on a regular basis will. “It can cause us to swallow excess air, which can fill up the GI tract and cause abdominal distention,” Werber says. Gum also contains a sugar substitute called sorbitol (found in many sugar-free and reduced-calorie foods), which can make you bloat. Sorry to burst your bubble. We know, we know. Sometimes you just need a hunk (of chocolate, that is). “A few pieces will be no issue for most people,” Werber says, but too much milk chocolate can make your belly bubble. The culprit? “Lactose (the milk sugar found in milk chocolate) produces gas in some people, while other added ingredients, like high-fructose corn syrup, can be difficult to digest.” Werber suggests dark chocolate instead. Dairy products like yogurt, milk, and cheese contain lactose, a hard-to-digest milk sugar that can give your intestines a rough time, even if you’re not lactose intolerant. “The fizzy bubbles found in soda, seltzer, and beer are generated by CO2 (carbon dioxide gas), which can cause bloating,” Werber says. There you go: more incentive to cut back. There’s a reason they make you so gassy. Chickpeas, kidney beans, and lentils are considered galactans. They contain galactose, a type of sugar molecule that is hard to digest. They can serve you well when you’re forced to eat on the go. 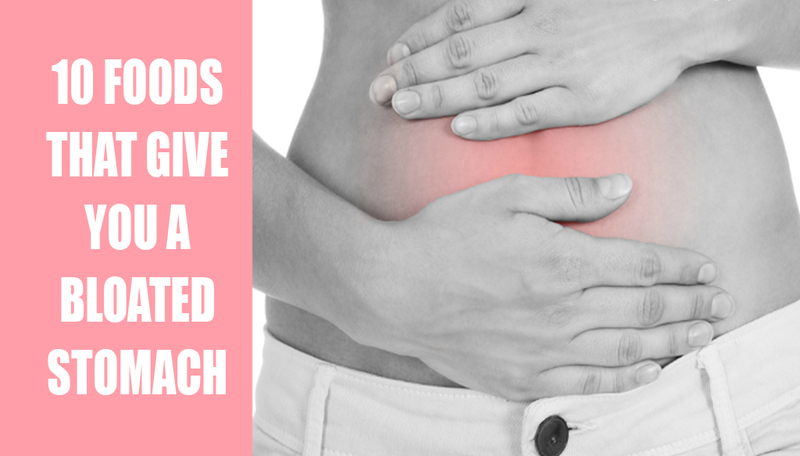 But bloat-causing fructans, or fructose molecules, can make them a bad choice for beach snacking. The bolder the flavor, the better, right? Not when it comes to belly bloat. Garlic, leeks, onions, and shallots are all fructans. Better be careful with high-fructose corn syrup, which is hiding in dipping sauces like ketchup, barbecue sauce, and pancake syrup. Like fruits, they contain fructose, which is bad news when you’re trying to flatten that tummy.